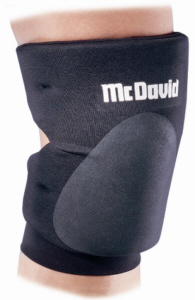 The #646 Deluxe Volleyball Knee Pad is designed for volleyball, this quality product features 1/2" thick closed cell athletic foam padding for optimum energy absorption. Notched sides allow for freer movement and increased comfort. Housed in a durable nylon/polyester cover with elastic straps forming an open back design allowing greater freedom of movement and comfort. Teflon® coating reduces friction and improves wear. Sold in pairs.